To the casual sports fan, the phrase Copa America Centario may not mean much. But in soccer circles, it’s a pretty big deal indeed. The Copa America is the oldest international soccer tournament in the world and one of its most elite. And—bonus for U.S. fans—for the first time in its 100-year history, the competition, which is South America's championship, is taking place on U.S. soil. The tournament has already kicked off with group play, but it runs through June 26 in 10 marquee venues across the country, in major cities like New York, Seattle, Boston, Los Angeles, and Philadelphia. Since the June 3 opener, fans have packed stadiums to see some of the world’s top soccer talent battle it out on the pitch. The 16-team pool features top teams from South America, plus six teams from North and Central America and the Caribbean, including host United States. But you don’t have to live and breathe soccer to appreciate the excitement and action Copa America brings to the United States. Here are 7 great reasons to make a fun early summer adventure around a Copa America 2016 game. 1. You can savor the true essence of the sport without having to go overseas. Over the last decade-plus, the U.S. has made incredible strides in terms of creating an exciting soccer culture on its home turf. But to really experience the essence of the sport’s passion and revelry, fans have needed to travel outside U.S. borders—think a Latin American country, the Caribbean, or Europe, where the excitement of nearly every match rivals that of a high-stakes football or basketball game here in the States. 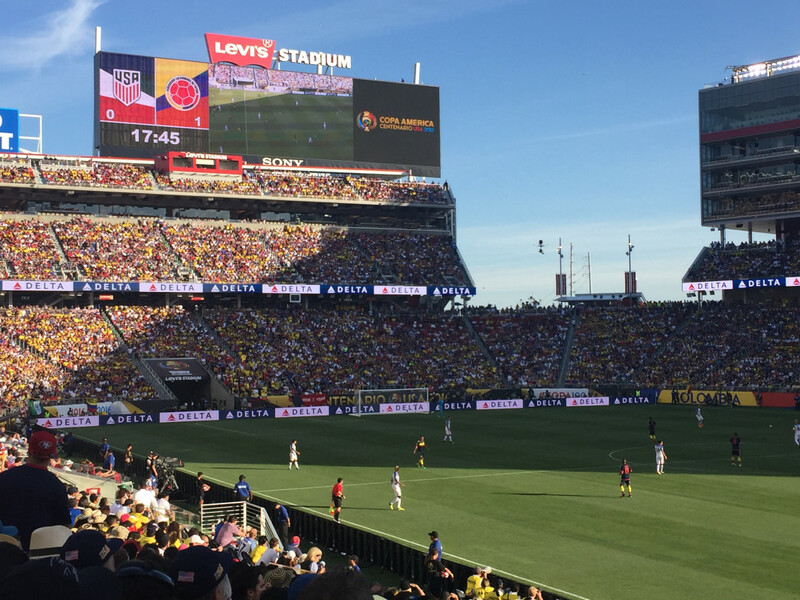 Copa America brings that fervent passion to stadiums in many Americans’ backyards, like the sold-out crowd that packed Levi’s Stadium in Santa Clara to watch Argentina top Chile 2-1 in both teams’ opener. 2. Superstars like Lionel Messi and Javier Hernandez playing on American soil. At a closed practice prior to the Argentina-Chile match at Levi’s Stadium, fans resorted to lying on the curb to catch a glimpse of Argentinean legend Messi underneath the screens surrounding the field. He didn't play in the game, unfortunately, as he was still nursing an injured back, but even the hope of an appearance has fans eagerly anticipating every Argentina match. Bottom line: Messi’s star power—along with those of Mexican standout Hernandez, and other top talent from around the world—is worth coming out for. No second-rate stadiums here: Copa America organizers went big booking venues with at least 50,000 seats: L.A.’s Rose Bowl, Soldier Field in Chicago, and Lincoln Financial Field in Philly, just to name a few. Fans have held their own, too, with roaring crowds waving home country flags, wearing their team's colors, and generally creating an electric atmosphere fitting for such top-notch stadiums. 4. An exciting U.S. squad. After a disappointing 2-0 loss to Colombia in the tournament opener, the U.S. squad came barreling back with a 4-0 route of Costa Rica. Hard-charging veteran Clint Dempsey, one of the most recognizable stars on the team, defied critics calling for him to be benched with an outstanding game that included an assertive penalty kick goal early on, followed by two splendid assists later in the game. Jermaine Jones, Graham Zusi, and Bobby Woods also each tallied a goal, illustrating the team's wide scoring threat. If the U.S. continues to play this well, it should advance from group play and into the quarterfinals: an objective that eternally upbeat coach Jurgen Klinsmann has had his eye on, and something for every U.S. fan to cheer about. 5. It’s a great excuse for an impromptu road trip. If you’re itching to pack up the car and hit the open road to kick off summer, why not make it a soccer-centric trip? Take your pick from exciting, soccer-loving cities like New York, Seattle, Santa Clara, Boston, Chicago, Houston, Orlando, Los Angeles, Philadelphia, and Phoenix, all of which will host at least three games. And with the tournament running through June 26, there’s still plenty of time to grab tickets or join fellow fans at sports bars and pubs showing the game—always a guaranteed good time. 6. There's still the lingering whiff of scandal. Let's face it: Events of all kinds are more interesting with a hint of controversy, and this Copa has no shortage of it, starting with the illegal bribes for commercial rights to the tournament that a high-ranking exec of one of the organizing associations plead guilty to receiving. Then, there are the sound snafus: At an opening match between Uruguay and Mexico in Glendale, Arizona, the Chilean national anthem, not Uruguay's, was played; then, in a later match, Chile had its national anthem cut short by a Pitbull song. The Copa America organizing committee issued apologies for both errors, but even so, it's hard not to wonder what might happen next. 7. It’s excellent prep for World Cup 2018.